Heaps of discarded toys + one hot glue gun + two innovative girls = MUTANTS! Some of Annabel and Elsa’s mutant creations. A plastic green army man, in crawling position, bears Cinderella’s head. Shrek’s body kneels on the ground, with the face of a kewpie doll who needs a haircut. Tigger of Winnie the Pooh waves, using arms from a Barbie doll while balancing on ice skates. The mutants are here. And there are many of them. For 11-year-old girls Elsa Rudolph Swanson and Annabel Dudash, both students at Oakland schools and friends since preschool, modifying toys into Mutants has become a passion. Elsa (left) and Annabel (right). 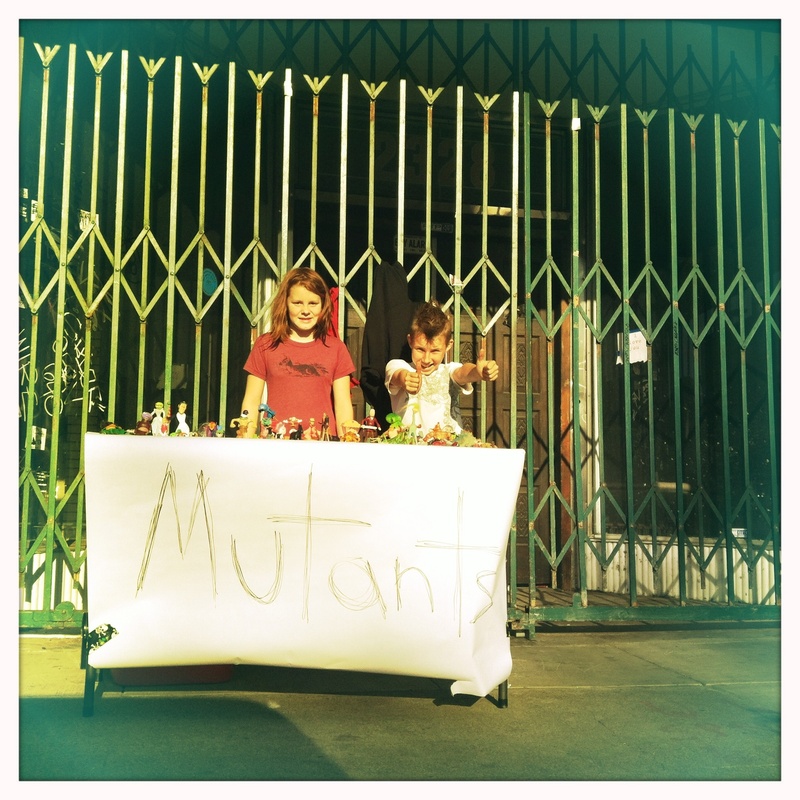 For two years now, the girls have sold their Mutants at the monthly Oakland Art Murmurs; they’ve been featured in magazines; and the Oakland Museum has even lent their support to the girls in creating their toys. In a short interview, Annabel said that she originally wanted to make party favors for her 9th birthday party and found some old toys that she could re-fashion and give out. 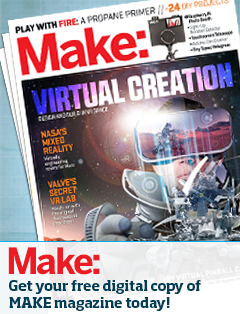 “[My friends] loved them, and we didn’t have a hot glue gun, so we used wire,” she said. Mutant-making at the Oakland Art Murmur. Since then, the idea took off. These days, Annabel and Elsa use a hot glue gun to hack the toys, and at their recent Art Murmur table, they had twelve glue guns going at once as countless people made their own Mutants. “We’ve made so much,” Annabel says. Russell, her dad, estimates that they’ve created hundreds of them. “We started pillaging toys from every thrift store we could think of,” he said. 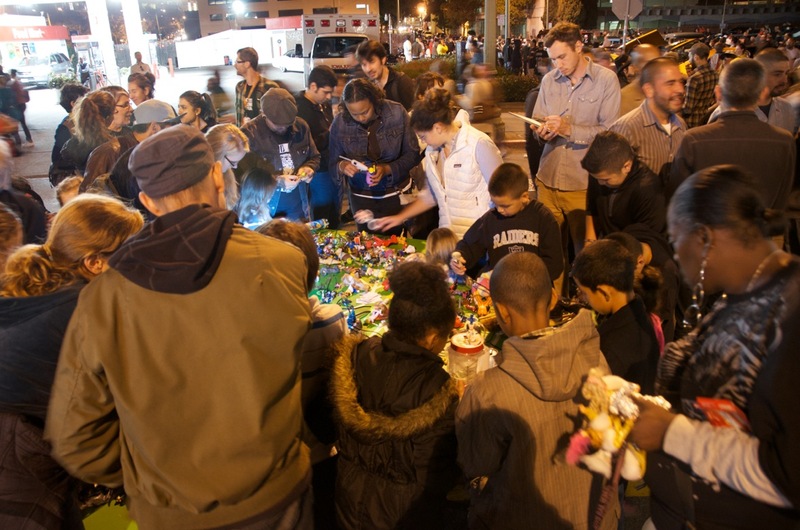 “And then when we started going to Art Murmur, people would say, ‘oh great, you’re here!’ and they would just give us heaps of old toys.” Family members would send them, too. Eventually, Russell struck a sweet deal with Goodwill’s processing plant, and he and the girls have been able to dig through the barrels of discarded toys and take home dozens of pounds of toy parts. They then spend as many hours as they can, barring homework and bedtime constraints, cranking out toys as fast as possible. Annabel and Elsa have a website, a Flickr page, and have completely sold out their wares — priced from $1-$5 — at various Art Murmurs over the last two years (they used the profits to buy an iPad and an iPod). At the Mini Maker Faire, Annabel and Elsa (with help from their proud parents) will set up tables with Mutants, and everyone will be welcome to make their own Mutant. Check them out! HACKERMOM [băd’ ăss]: That’s you. Creative, curious, inventive, indie, artsy/craftsy/ designy/techy, visionary, outspoken, scrappy, superhot, hands-on, mover and maker of any age. “This is way better than any moms’ group I could have ever hoped for,” Julie says, her smile radiating as she sits at the community work table in the center of the Mothership Hackermom space. 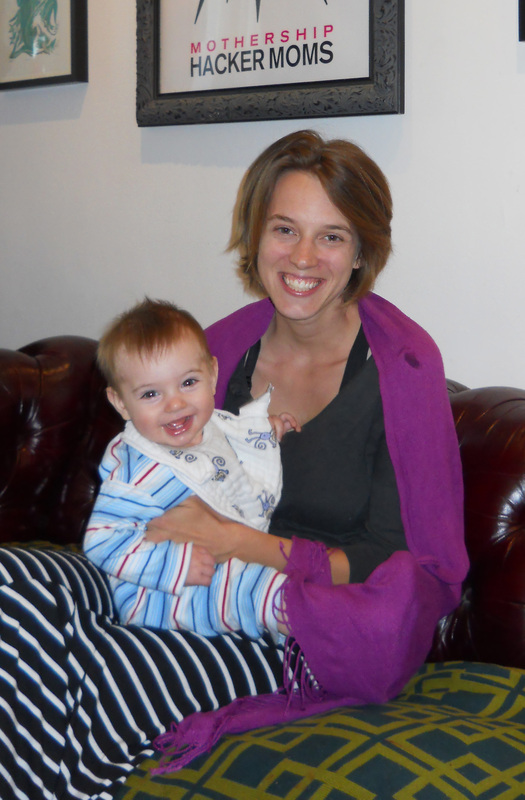 Julie, the mother of 14-month-old Josephine, is one of the first members of Hackermoms. She said she knew about the hacker community, but thought it wouldn’t work with her mothering lifestyle. But when she heard about the Hackermom collective, all that changed. On Adeline street, near Alcatraz avenue in South Berkeley, the Mothership Hackermom space is truly different. Built as a space for mothers of small children to do their own work — and the first hackerspace for women ever — at least 21 members (and the membership is increasing steadily) are given free reign to explore creative expression within an intentional community of other creatively-minded moms. Artists, designers, small-business entrepreneurs, writers, and editors hang out, plunk themselves and their laptops or art projects onto a long communal table, and get to work in a supportive atmosphere. Significantly, the Mothership collective not only supports the DIY philosophy but provides on-site childcare while moms work. You read that correctly — on-site childcare, built into the membership package. “Once I saw this community, what moms were doing to still nurture and exercise that part of the creative brain, I knew that this was something for me,” Jane adds. Her son, Theo, is 17 months old and plays in a brightly-colored playroom adjacent to the main space. Jane’s a cookbook editor and a former journalist for several well-known Bay Area publications, and comes to the Mothership several times a week for 2-3 hours at a time. “There was no support network for moms trying to do other stuff — either you have to choose between fulltime daycare or be a stay-at-home mom,” she explains. 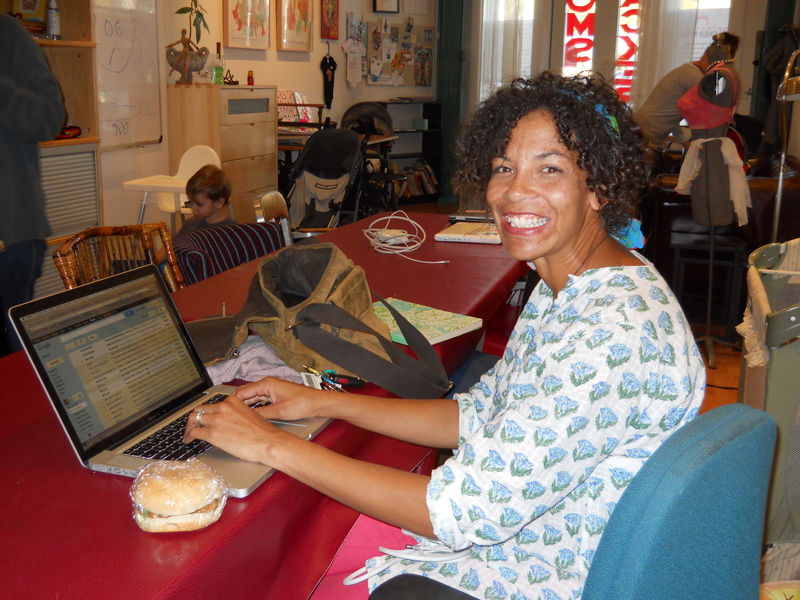 But with the discovery of the Hackermom space, Jane’s been able to focus on her work and form community. “Our members can keep their online businesses going — we have artists who have Etsy shops, writers … and that’s only possible because of the free childcare we offer to our members.” Sam points to a bulletin board on the wall behind the communal table with the words “FAILURE BOARD” written on the top. I can’t resist. “Failure board?” I ask. She grins. Even the childcare innovation at Hackermoms is unique — they work with an outside work-training program that trains childcare providers. They’re fully vetted, come with background checks, and gain experience while the moms work. At the 2012 East Bay Mini Maker Faire, the Hackermoms will be showing off their DIY creativity with a Dia De Los Muertos-themed booth, next to the booth for Hackerscouts — the Hackermom-sister program which Cook and her husband also run which incorporates craft hacking for kids. August has a reason to be specific: while food trucks and independent food vendors are gaining popularity across the US (there’s even a reality show on television now about food truckers who race around the country, selling their delicious wares), and in California in particular, Oakland has put up barriers of red tape that make it nearly impossible for the food truck culture to proliferate and attract customers. That’s why August has set up her refurbished one-time hot dog cart she found on Craigslist, calling her business Guerrilla Grub. The cart is more compact, mobile and easier to maintain than a food truck while Oakland sorts out its mobile food bureaucracy. Selling “California comfort food,” she and her husband sell classic but modified dishes like pulled pork, beef brisket and pulled-tofu sandwiches, sloppy joes (meaty and vegan), veggies, quinoa, and gluten-free mac and cheese. 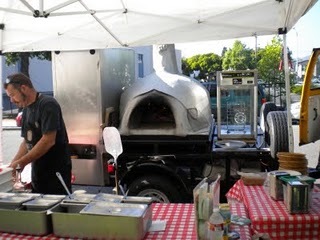 As the East Bay Express reported recently, August, who is with the Oakland Mobile Food Group, has been battling Oakland city hall along with other food vendors to relax the red tape around mobile food vendors and expand the realm of DIY entrepreneurship that adds to the dynamic cross-culturalism of the city. August and members of the Oakland Mobile Food Group are putting pressure on the city — they gathered more than 500 signatures on a petition at the Eat Real festival that will be submitted to the city council. She’s hopeful that mobile food vendors will be able to grow their businesses and introduce Oakland’s children and adults to excellent, delicious, mobile food. Tacos Zamoranos – the first taco truck in Oakland! Remedy Coffee – check out their new modded Airstream! 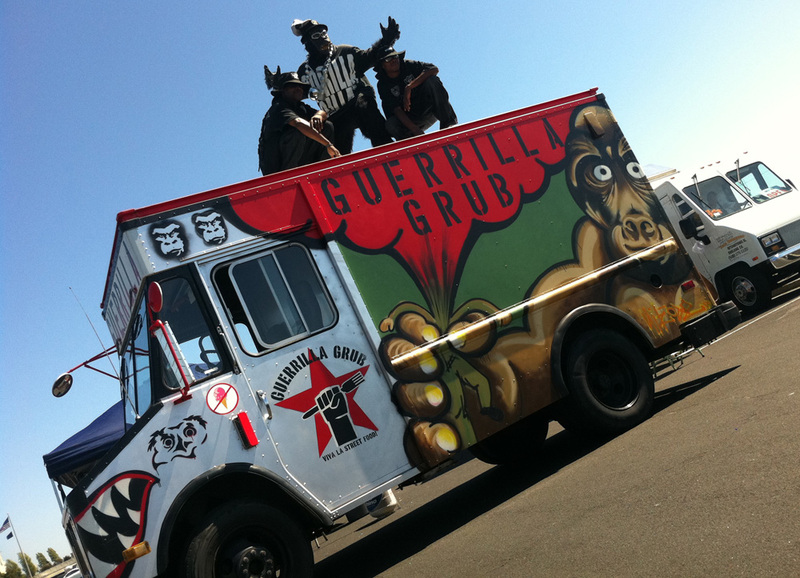 You can follow Guerrilla Grub on Twitter, to see where the cart shows up next. But don’t miss the chance to come support their efforts in person, at the East Bay Mini Maker Faire!